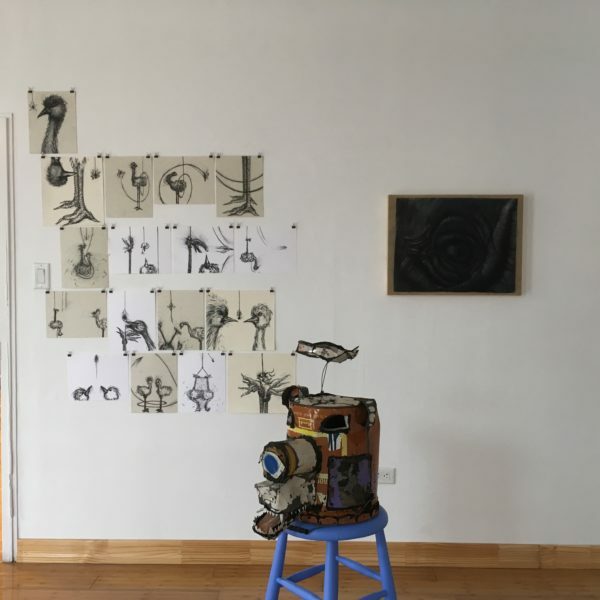 Paul D’Agostino, Old Hat, Starring One Side & Two Ostriches, 2013, Sequence of 17 Drawings, Charcoal, graphite, oil pastel on paper, sizes various, 5 x 5’ as installed. 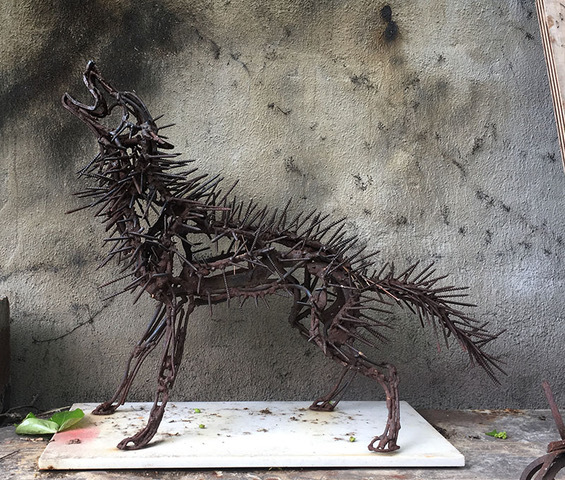 Matt Blackwell, Bear, 2018, Metal, cans, wire, paper, paint, stool, 48 x 18 x 16 inches. Thibaut Dapoigny, Regardez, 2016, Chalk, charcoal, wax on board. 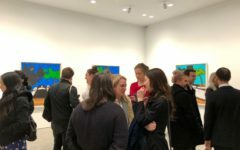 “Beasts of Brooklyn,” curated by local artist Elisa Jensen, has 28 artists in her show, all of them depicting animals and other creatures, many of which are not found on the crowded pavements of New York City’s great borough. 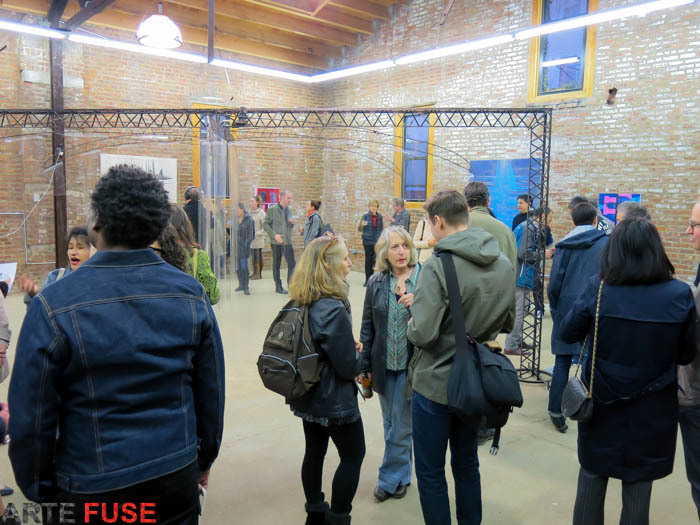 Jensen is strongly involved with the already well-established Brooklyn art scene, and she has given voice to more than a few of the many artists living there, who are strongly committed to maintaining their vocation–often in face of neglect. Animal shows are fun, and can even demonstrate gravitas, a noun we don’t often associate with living presences outside the human species. Some of the paintings and sculptures do in fact present a level of seriousness we don’t normally think of in connection with this kind of subject, but there can exist a genuine sensitivity between the painter or sculptor and the living thing that is being represented, with the result that depth is found in the image. Also, as a genre, we should remember that depicting animals is sufficiently expansive to support a major artist–we need only to look at the career of the 19th-century British painter Edwin Landseer, whose memorable paintings of animals are permanently inscribed in cultural memory. These days fine art needs to and often does shoulder responsibility for keeping our visual knowledge of other species alive, even if they should be so insignificant a presence as a wasp, whose image does make its way into the show via a painting. 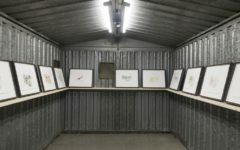 In light of a vanishing landscape and given the fact that the show is taking place in a fairly rough area in Brooklyn, the animals should remind us of how biology can be inspiring still, if we allow it to be so. And, a bit surprisingly, this show does do that. In this light-hearted, slightly crowded exhibition, given in a gallery established in a building owned by a local church, Jensen included many kinds of animals: we find dogs, rabbits, cats, birds, even a salamander. One would be hard put to easily find a salamander among the parked cars and oil-saturated pavements of Brooklyn, but it is likely that in some of the larger parks it is possible to come across one. (It may even be that natural life is returning to the parks on a larger level; in the past five years, there have been news stories of coyotes making their way into Van Cortlandt Park, the major park of the Bronx!) In a way, the works are exercises in humility in their deference to non-human life, and necessarily participate in figuration, even when there are decidedly abstract effects. The main point to be taken from this very enjoyable exhibition addresses the cultural treatment of natural phenomena–and given contemporary art’s penchant for politics, whether fine art can make a difference in our commitment to protect and sustain the creatures portrayed. 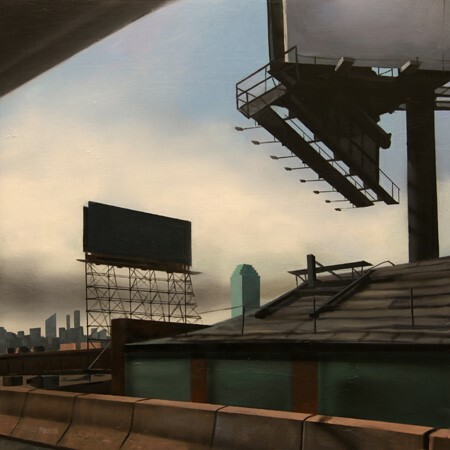 It is hard to be completely optimistic about one’s wish to see nature reassert itself in Bushwick, but maybe the pleasure generated by “Beasts of Brooklyn” will not only solace the artists who made the images but also supports the ongoing lives not only of domestic animals like cats and dogs, in addition to those living things that occur in more scarcely populated areas like New York’s Upstate. Glenn Goldberg, Orange Peace Dog, 2014, acrylic on canvas, 12 x 6 inches. Wendy Klemperer, Howling Naildog, 2012, Steel, 24 x 30 x 9. The images themselves are hardly experimental–it is difficult to see a cat in an entirely innovative fashion! 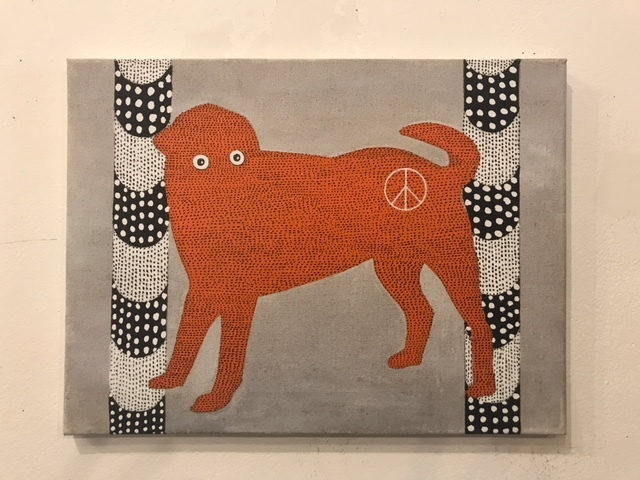 Glenn Goldberg’s Orange Peace Dog (2014) is a small work, 12 by 6 inches, but it is a striking image of an orange mutt whose coat is covered with dots, a white peace symbol painted on the hindquarters of the animal. Except for the eyes, no other facial feature is available to see; the dog is flanked on either side by a pole with sections patterned in black and white dots. Originally a sign favoring nuclear disarmament, the peace symbol dates back to the late 1950s, but maintains prominence even today as a sign of nonviolence–there is truly something Sixties-ish about this painting and other examples of the show’s collection of images! Wendy Klemperer’s Howling Nail Dog (2012) portrays an animal seemingly in distress, its form eerily realistic despite the fact that it has been made entirely by nails. The dog looks a lot like a rail-thin coyote, emphasized by the thin nails, repeated to bring about the form. Nails remain a staple of carpentry, so the gap between the image’s industrial facture and its final, organic gestalt as something wild couldn’t be farther from each other. Even so, the dog is memorable, its menace coming from both its uplifted stance and its materials. Carrie Waldman, War with the Efts, 2018, Pigment and acrylic medium on wood panel, 12 x 12 inches. Jackie Statz, Mare, 2018, Ceramic and acrylic, 10 x 6 x 8 inches. Susan Sussman, In the Trees, Pastel on paper, 28 x 14 inches. 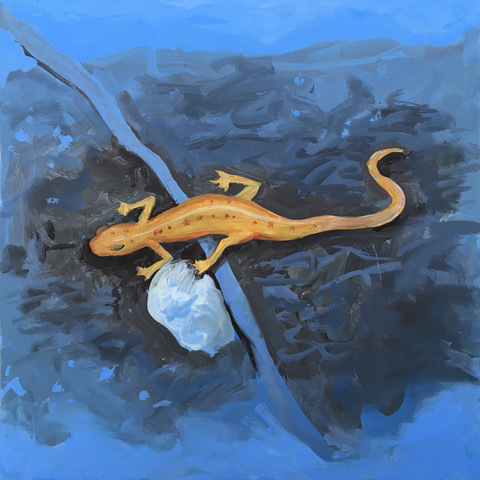 Carrie Waldman’s War with the Efts (2018) concerns a mustard-brown salamander making its way across a blue puddle, which could be in an urban place or, more likely, a rural one. It is crossing a bright blue stripe standing on top of a darker blue blot, likely a small pool, with a white blotch close by. Salamanders are scarce in New York City, and Waldman’s title more than suggests an antagonistic relationship between people and these delicate creatures. But we don’t know where we are in the work, which might be of a place close by or much farther away from New York. Susan Sussman’s In the Trees (2016) looks very much like a study painted more than some distance from Brooklyn; it is composed of several tall, narrow trees, whose lower trunks are painted white. On the ground, between the single trees making up this partial copse, we see two cows close to a reflective pond, with bits of a light green meadow that is perceivable. While the work is entirely conventional, its subtle color sense and genuine feeling for nature make it stand out. 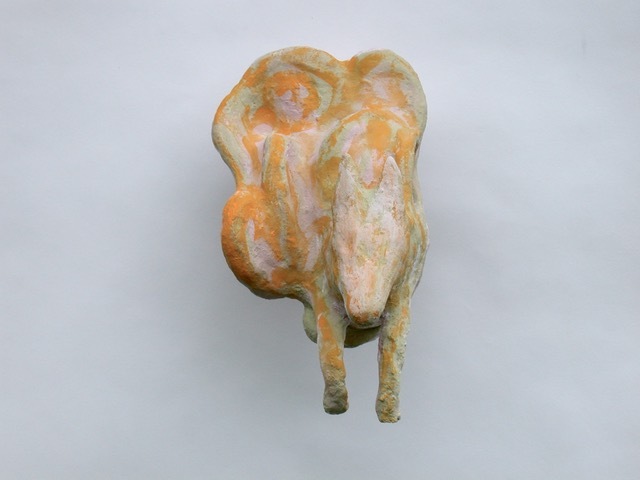 Jackie Statz’s Mare (2018) is a small, yellow ceramic, in which the body of the horse is compressed and attached to the wall, its haunches severely flattened. The head and front legs, vertically aligned, push outward to meet the viewer. It is, from the point of view of formal accuracy, extremely idiosyncratic in its posture, but that gives the sculpture its intensity and interest. Horses have been domesticated by people for a very long time, so we know them well. But this work restores the creature’s animal nature in a way that keeps its original wildness alive. Seth Becker, Hummingbird, 2018, Oil on panel, 14 x 11 inches. 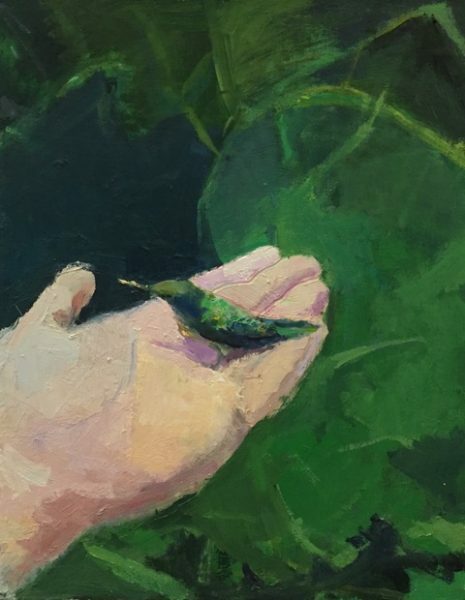 Seth Becker’s Hummingbird (2018) shows a pale white hand holding a hummingbird against a background of a large, dark green leaf. The painting is wonderfully expressionistic, with the bird realized particularly well. The handling of paint recalls the brushwork of Fairfield Porter, the outstanding realist painter who worked during the time of abstract expressionism. It is a painting charged with sympathetic energies. 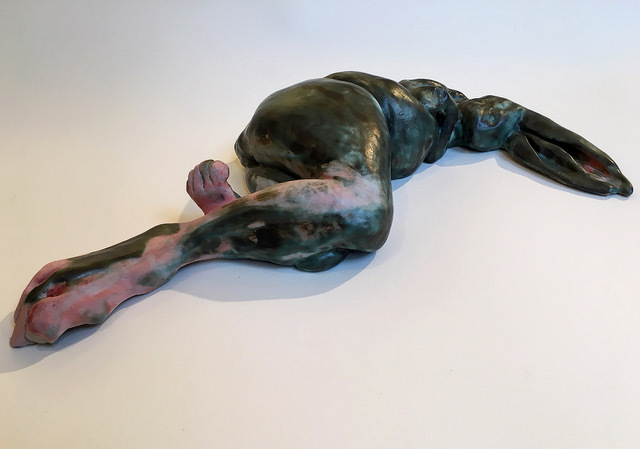 The last work to be mentioned, Jenny Lynn McNutt’s Shutter (2017), is a dark-blue ceramic rabbit lying sideways; its motionless lack of defense indicates the animal is dead. As a natural study, it succeeds really well, but it could well serve as a visual elegy for a nature that is receding moment by moment, almost before our eyes. The other works in the show are equally strong, but unfortunately, have been left out for reasons of space. Jenny Lynn McNutt, Shutter II, 2017, Ceramic with glazes, 16 x 19 x 4 inches. “Beasts of Brooklyn” establishes a not-quite-breathing iconography that emphasizes everyday natural life; we don’t come across images of creatures that are terribly exotic or rare. Even so, on a deeper level, it raises the question whether the animals we are in fact seeing in the exhibition will have an extended future. 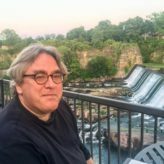 As easy as it is to sound apocalyptic on this topic, fulmination should be avoided–it may still be possible, even so late in historical culture and the depredation of our lands, to save that which we haven’t already destroyed. One doesn’t want to overweight a show that is essentially free in spirit with a heavy-handed moral purpose; it isn’t true to the exhibition and won’t work as a path to saving the fauna we see. But we can acknowledge, even in the praise of animals that animates the show, a quiet warning: we must do our best to keep the complex diversity of the natural world alive. 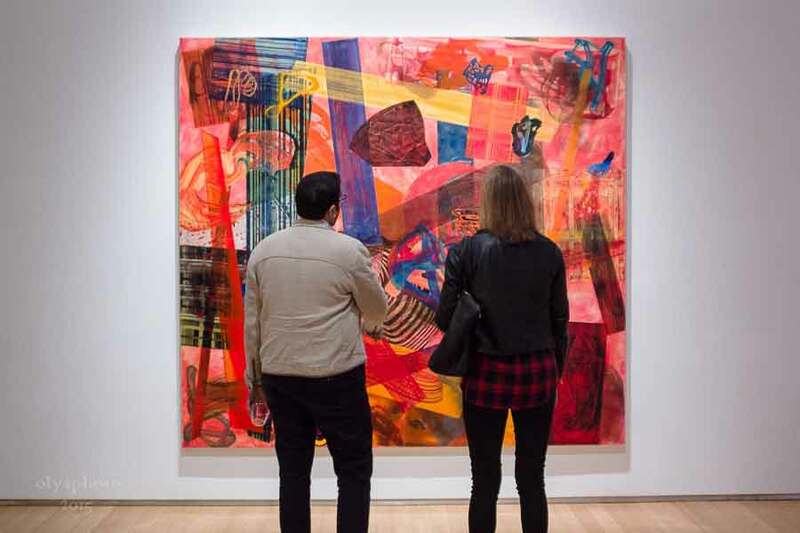 Participating Artists: Paul D’Agostino, Mike Ballou, Seth Becker, Blackwell Matt, Arthur Cohen,Thibaut Dapoigny, Mary DeVincentis Herzog, Lois Dickson, Rodney Dickson, Glenn Goldberg, Kurt Hoffman, Elisa Jensen, Wendy Klemperer, Lucy Lamphere, Deborah Masters, Jenny Lynn McNutt, Laura Murray, Joyce Pensato, Martin Seck, Jackie Shatz, Kim Sloane, Susan Sussman, Lawrence Swan, Fred Tomaselli, Carrie Waldman, Sally Webster, Megan Williamson, Joyce Yamada. Photographs courtesy of the gallery.